Bellary Fort is the prime attraction of the city and also known as Bellary Gudda. Hande Hanumappa Nayaka has constructed the fort, during the period of Vijaynagara Empire. 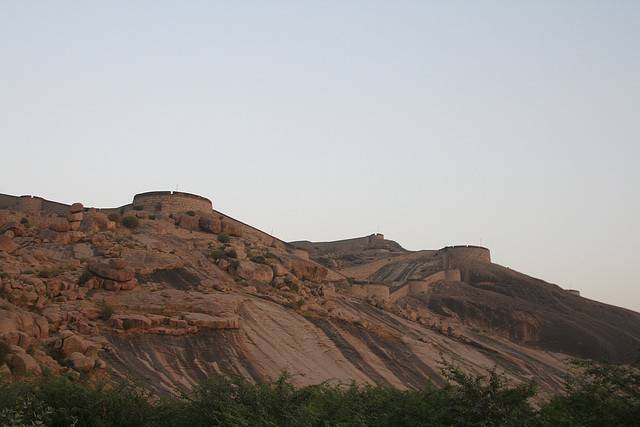 The fort is situated at the apex of the hill. The famous rulers who have ruled at this fort are Tipu Sultan and Hyder Ali. The fort has been built on a monolithic rock and had seven-color water flowing through the tunnels. The fort has been divided in two parts one is the upper and the other the lower one. Every evening the fort is illuminated using 188 beautiful lights to display its grandeur. The lower fort is a part of the Bellary fort and had been constructed by Hyder Ali. The fort is located on the eastern end of the monolithic rock and has two entrances. It measures about half a mile and has armory and garrisons. Just outside the temple, one can see a beautiful religious shrine devoted to Lord Hanuman. Currently, the lower fort has offices, churches and other institutions.